The period is now open to file an application for the Joseph S. Murphy Institute Scholarship for Diversity in Labor for Fall 2019 admission. Well qualified candidates should be encouraged to apply. The two-year Scholarship offers students enrolled on the graduate track up to $30,000 and, those enrolled on the undergraduate track up to $20,000. Following successful acceptance to the academic program of their choice, candidates may be considered for the Diversity Scholarship after submission of a completed Scholarship application by the deadline date, which is also indicated below. Candidates may complete the academic program and Scholarship applications simultaneously, but must be accepted to the academic program before they can be considered for the Diversity Scholarship. Two major outreach efforts were recently undertaken for the 2019 recruitment period. 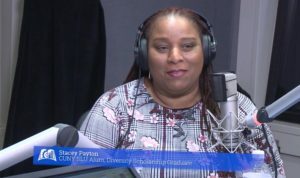 The first, on 12/27/18 the Diversity Scholarship Team shot a video podcast for CUNY-TV. 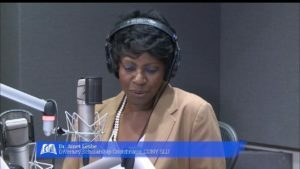 Stacey Payton, (MA ‘2017) a Diversity Scholar Alumnus, discussed the MALS program and the opportunities that have opened up to her as a result of receiving the scholarship. 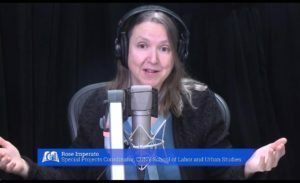 The video podcast is airing periodically on CUNY-TV through 2/19/19. Check it out here. The second major recruitment and outreach activity centered around, a Diversity Scholarship Information Open House, which was held on 1/16/19. Nicolas Pineda Jr, (BA ‘2019) (pictured above) spoke eloquently about his 21-year journey toward his undergraduate degree, which he will receive at the end of the Spring 2019 term. Tuesday 2/19/19 – Early admission deadline for completion of the Academic program application. Including receipt by CUNY- SLU of all supporting admission application documentation. Tuesday 3/19/19 – Deadline for completion of the Diversity Scholarship application. Including receipt by CUNY-SLU of all supporting scholarship application documentation.